The WaterWise Garden: An introduction to Xeriscaping and reducing the amount of water you need for a beautiful garden year round. As we get into summer, many of us are concerned about how well our gardens will survive as it gets hotter and we have to work within the city’s water restrictions. The key to a beautiful, drought resistant garden is Xeriscaping – which really just means ‘water wise gardening’. It may seem complicated, but once you understand the principles, it makes sense and it has the added bonus that it will not only save water, it will also save you time and money. It’s all about having the right plant in the right place. It’s about grouping plants in the garden according to their needs and the site conditions. You are already used to grouping plants according to whether they like sun or shade or a bit of both. Xeriscaping takes that just a step further by also grouping them according to how much water they like. The obvious advantage of this is that you don’t damage plants that prefer dry conditions by overwatering to satisfy the needs of ‘thirsty’ plants and visa versa. You also contain your watering to specific areas instead of having to water the entire garden. As we wrote in a previous article, good gardening begins with conditioning your soil. The most effective way is by adding compost which helps retain moisture in dry, sandy soil and also improves drainage in clay, wet soil. If you have either of these types of soil, you should know that they both have upsides and downsides. Clay retains nutrients while sandy soil allows good drainage. Adding compost helps to maximize the good points while alleviating the bad ones. Adding a few inches of mulch on top of the soil will also help to retain moisture by slowing down the rate of evaporation. Once your soil is prepared it’s time to begin assessing your current plants. Make a note of those that need to be watered a lot and those that don’t. The ones that need more water are those that tend to go pale and droop in hot weather or when you haven’t watered for a day or two. Conversely, the ones that don’t like too much water will droop if you water them too much. Next, think about the situation of your garden. Do you have wind channels funneling through it during the windy season? Winter winds can freeze plants while summer winds can dry them out. The solution is to create wind breaks with hedging. Do you have a lot of lawn? Grass is ‘thirsty’ and can require up to 3″ more rainfall in some areas to keep it healthy. If you want to reduce the amount of watering you do and if you could do without mowing the lawn, consider reducing the amount of turf or even replacing it entirely with less thirsty landscaping. There are a number of drought resistant ornamental grasses and groundcovers that provide a suitable alternative. If you must have lawn, then make sure you have at least 4″ to 6″ of good top soil and don’t mow the grass too short. Longer grass has deeper roots meaning it’s able to find water more easily without help from you. Do you have a sloping garden? If so, you might not have thought about this, but you are losing a lot of water. Water runs down slopes. ‘The solution is to either flatten the slope or to terrace it. Do you have berms? Berms are raised ridges often used to add depth and interest to a garden. Having them along curbs or walkways is another way to lose water, for the same reason that slopes lose water. They’re useful in areas where the plants are drought resistant as they funnel the water away. If you’re looking to conserve water and use it where needed, channel out these areas so that the water collects and then funnel it to where you need it most. What about vegetable and fruit gardens? Yes, they can be waterwise too! If you have raised beds, then these will dry out quicker than either flat beds or beds situated on gentle slopes. The solution is to add compost and to mulch at least 4″ deep in order to minimize evaporation and maximize absorption. Before mulching, wait until the weather warms – if you mulch too early, the soil will be too cool. After a good watering or rainfall, add to mulch to beds where the plants are tall enough. If you are having a very wet summer, remove some of the mulch to prevent rot and slugs and snails. Mulches for vegetable gardens can include: straw, leaf mold, grass clippings and even newspaper. Generally vegetable beds require an inch of water a week, administered as half an inch twice a week. No matter how carefully you choose drought resistant plants, remember that even they need some water, especially during their first year. It’s important to water consistently until they’re established. The best time to plant is when it’s cooler, during spring and fall when there’s adequate rainfall. This helps their roots to become established so that later they will need very little watering during the hot, dry season. If you’re stuck for ideas about how to make your garden water wise, ask us for help. We also encourage you to visit other water wise gardens and demonstration gardens. Take note of which plants in your neighbourhood tend to do well with minimal watering during the heat. Plants such as Iris Germanica, Daylilies, Peonies and Lilacs seem to thrive no matter how much they’re neglected. Read up on the topic. Join a garden club. Follow web sites and blogs that feature water wise gardening techniques. With a little planning, you can have a water wise garden that looks great no matter what time of the year it is. All using less water than your lawn! Look out for our next article on “How to Spot a Drought Tolerant Plant.” We’ll also share some sketches of different water wise garden layouts. Lavender is a versatile culinary herb and has been used for cooking and medicinally for over 2,500 years! If you’ve never used Lavender flowers for baking, why not try it now? It’s easy and you’ll love the results – not to mention enjoying the compliments of friends and family! Shape into a log about 10-inch long and 3 inches wide. Put slices with the cut side up on the cookie sheets and bake another 15 minutes or until crisp and brown. Remove cookies and allow to cool. Store in an airtight container and eat within two weeks. Serve with tea or coffee. Succulent Frame – Pretty As A Picture! There are few things that are as impressive, yet so easy to make, as a Succulent Frame. It looks exotic. It looks eclectic. It looks… expensive! The good news is that it’s super easy and affordable, if you do it yourself. Although a Succulent frame looks as if it’s a difficult thing to make, if you follow the easy, step by step process in the video above, you’ll find it’s really quite simple and it’s a fun thing to do. You can complete the entire task in just a couple of hours. First of all, you need to prepare the succulents cuttings. The succulent cuttings should have stems of at least 1/4″ long. The cuttings can be taken from existing succulents you have at home, or you can purchase succulents from us. You will need to prepare the succulent cuttings a few days ahead of time. Cut the cuttings from the main plant and lie them in a cool place for a few days to allow the stems to callus over. Secondly, you’ll need a frame with a backing and a mesh to keep the soil and the plants in place. You could make the frame yourself using rustic, old, weathered pallet wood, or you can recycle an old picture frame. Once you have a frame, simply attach a piece of light weight material to the back – you could use hardboard or even heavy fabric. Next attach wire mesh to the front. You can either attach to the front of the frame and cover the edges of the mesh with a trim or you can cut a channel into the frame sides so that the mesh is below the front edge of the frame and the mesh edges are neatly tucked away. The next step is to fill the frame damp cactus mix soil. Now it’s time to plant! Push the succulent cuttings into place through the mesh into the soil. Remember to leave enough space for the succulents to grow and fill out the frame. 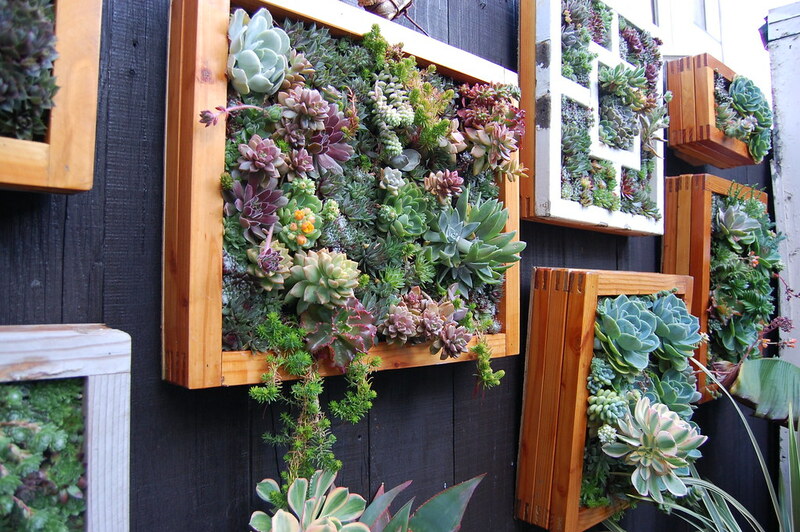 Once your succulents are all in place, lie the frame on the ground (if it’s not there already) and water lightly. Place the frame in a cool area and leave it lying flat for a week to ten days so that the succulents have time to root well into the soil. Once they’re rooted, hang the frame on the wall and enjoy the admiration of your family and friends! Don’t forget to send us a picture of your beautiful D.I.Y. Succulent Frame! Create a fantasy Fairy Garden! We have a whole range of beautiful, teeny, tiny fairy ornaments in stock – all ready to adorn your precious fairy garden. Fairy Gardens are so much fun – whether you’re a teeny, tiny little one or an adult who never quite relinquished your childhood dreams! Come into Tanglebank today and choose your favorites before they are all gone! If you love the idea of creating your own special Fairy Garden, but aren’t sure how, why not join us for a hands-on workshop on June 18th at 10am? This is just one of the awesome soap varieties we have in stock. It’s ‘Black Amber’ which is an amazing man’s soap. If you’re looking for the perfect gift for the man who has everything… this is it! Guaranteed he doesn’t have it and he’ll love it! “During winter and spring the Mistral wind sweeps down from the Alps across the storied landscape of Provence, leaving behind luminous, deep blue skies. Our collection of exquisitely scented bath, body and home products takes its name from this legendary wind whose fragrant course is shaped by the mountains, rivers and plants of the region. The Mistral wind moves over the entire Rhone valley, creating seasonal changes and spectacular climatic swings. It has a profound effect on the terrain by rejuvenating the soil, creating lush planting conditions and giving birth to fields of herbs and flowers. Come in and try them today! We’re excited to announce that we’re featuring the excellent wines from Singletree Winery on our Brambles Bistro Menu. Singletree Winery is a local Abbotsford Winery based in Mt. Lehman. A great opportunity to have a gourmet meal, try wonderful wines and support local business at the same time! What is Xeriscaping and Why Should You Care? If your toes curl up at the thought of the inevitable dry and crispy lawn, wilted flower bed and cracked soil, then you’ll definitely want to know about xeriscaping and what it can mean for you. Xeriscaping (pronounced ‘zeer-ee-scaping’) is not a new concept. In areas prone to drought, people have been using this gardening concept for quite some time. In a nutshell, it refers to the practice of using plants which are native to your region and can therefore survive the climatic conditions without much human help. In other words, your flower bed would be populated with flowers that might be seen growing in the wild and which will bloom and thrive without you spending hours each day watering them. Generally native plants are pretty hardy. They are able to weather drought and rainy seasons. Their big attraction in drought ridden areas is that they demand very little water. Xeriscaping also seeks to reduce the loss of naturally occurring water due to evaporation and run off. In other words, Xeriscaping is a very sustainable way of gardening. Many people are choosing to Xeriscape their gardens in ways that minimizes or completely removes the need for any lawn. Not only does it require little or no irrigation, it also requires less fertilizer. It reduces waste and pollution as well as the high levels of maintenance common with traditional gardens.